Only produced for one year closely after the first-ever 6204 Submariner, the 6205 was first to feature iconic Mercedes hands and text “Submariner” on the dial. Every Rolex Submariner since has inherited and built on this DNA. The appeal of the 6205 is clear; this is probably the cleanest Rolex design ever to feature “Submariner” on the dial. The 6205 is also very slightly larger than the initial 6204, with a marginally different design. The dial is radium (ah, the good old days) and gilt. The official depth rating was 100m. Some of their clients proved this incorrect, quickly prompting Rolex to innovate with the latter 6536/6538. All early brevet cases carry a very unique octopus logo case back. 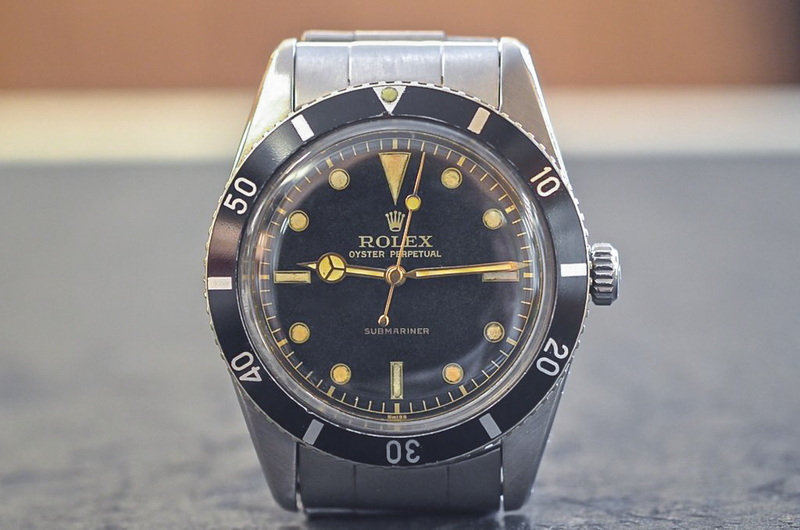 It was Rolex’s first 6mm crown, a size which carried on for decades. The 6205 carried on with the calibre A260 of the 6204. A few examples of 6205s have been seen with double signatures and/or straightened hands. But they’re very few and far between. The example shown here today is from Tempus Orologi, a very respected Italian seller. It comes with the original bracelet, but no boxes or papers. The patina is near perfect. The radium and gilt dial has darkened gracefully to a golden yellow. Polish has been applied, but the case has not lost its character along the edges. It’s a rare thing to find a 620X Submariner, let alone looking like what we see here. Find it here for an undisclosed sum.